If you’ve got back pain, then you’re probably reading this article because you want to get better and because you want to understand more about this problem and you want to get back to work. You are in good company because four out of five South Africans get back pain at some time. However, most bouts of back pain get better in a short time and simple painkillers are all that are needed. Getting back to normal activities is the best way to cope with back pain – not lying around thinking of nothing else but the pain! This article is aimed at people who have more persistent (long-lasting) back pain. It explains some of the causes of back pain and what can be done to help it and prevent it happening again. What’s in the anatomy of the back? 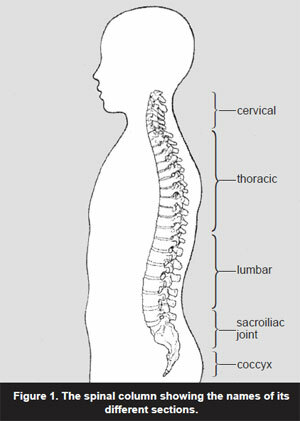 The back is a complicated structure built around the bones of the spinal column (see Figure 1). The spinal column consists of 24 bones (vertebrae) sitting one on top of another. It sits on a large bony bowl – the pelvis – and is topped by the skill. 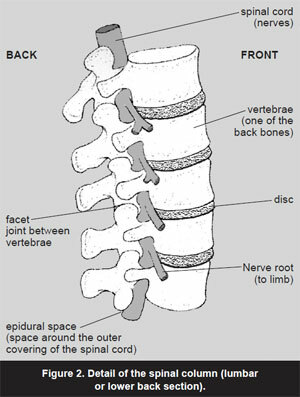 The bones of the spine are connected to one another by the discs at the front and by the facet joints at the back. The discs and facet joints allow the spinal column to bend and be flexible (see Figure 2). The nerves of the spinal cord, which connect the brain to the rest of the body; run down the hollow centre of the spine. Where the nerves pass out from the spinal column on their way to the muscles of the arms and legs they are known as nerve roots (see Figure 2). The bones of the back are also held together by tough bands called ligaments which, together with the spinal muscles, keep the back strong. The main muscles of the front and the back of the body are shown in Figures 3 & 4. Why do I get a bad back? 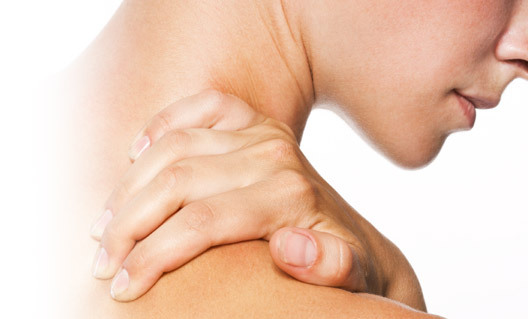 Sprains of the back are a part of everyday life and the back is usually very good at taking these ‘knocks’. Often you can’t remember a sprain – an awkward movement may have caught your back ‘off guard’ and ‘pulled’ a muscle or sprained a ligament. Most cases of back pain are due to these sprains which usually heal themselves within a short time. Some times back pain is due to a ‘slipped’ disc, in which part of a disc may press on a sensitive structure such as a nerve. Other causes of back pain are rare – they include inflammation (see the article ‘Ankylosis Spondylitis’), and bone problems such as a fracture, infection or tumour. Why does back pain become persistent? If your initial spell of back pain lasts a long time, then other events make it more likely to persist. For example, if the back muscles become weak, this reduces the ability of the spine to take further knocks. Weak back muscles also prevent you doing other activities and the body gets out of condition. This may affect your work, and your social life and personal relationships. Naturally, you may feel depressed and anxious in this situation and this could lead to further loss of confidence, frustration and anger, particularly if family members and the medical profession appear unhelpful or unsympathetic. It is important to realise that you may still have problems and suffer from pain even after the original cause (sprain or disc) has long since cleared up. Remember that pain may first cause you to lose you movement and strength. The longer this continues then the harder it will be for you to recover your movement and confidence. Remember also that any anxiety or depression you may feel while the pain last can prevent you getting back to normal. Your pain may therefore become persistent due to both physical and psychological factors. This can happen to anyone. Once it happens, both these factors can combine to create a vicious circle of pain. Most people manage back pain by themselves and recover without any lasting problem. But people who have had one attack of back pain are likely to have others. To help protect yourself from further problems you need to keep your back flexible and strong. You also need to think about prevention, such as learning the correct way to lift heavy objects. If the pain is severe or not getting better after a few days, you should see a doctor, physiotherapist, chiropractor or osteopath who will examine you to make sure your back problem is straightforward. They may advise specific treatments. These may involve manipulation (see section, ‘Would manipulation help?’) or exercises and education about back pain. They may also recommend some form of pain relief such as the use of hot packs, acupuncture or TENS. You may need an injection in the back area, particularly if you have sciatica. Will an Operation be needed? Surgery is only used in a few cases (probably less than 1% of all cases of back pain). For example, a large piece of displaced disc can press on the nerves of the spinal cord and cause bladder problems (such as difficulty in passing or controlling urine). In this rare situation, you need urgent surgery to remove the disc fragment. For severe cases of sciatica, surgery may sometimes be needed to relive the pressure on the nerve. In less severe disc disease, it is usually better to let nature ‘take its course’ and most will improve without surgery. Generally, the more active the better. Unless your pain is very severe or causing bad sciatica you should try to get mobile. Do some specific back exercises every day and some general fitness exercise as well. See the section ‘What back exercises should I do?’. Remember, specific exercises keep your back supple and strong, and general exercises help you feel good about yourself and help release natural painkillers (endorphins). What can be done for persistent back pain? If your back pain lasts for many months, the answer may be pain management – this aims to teach you how to cope with the pain. Understandably, people avoid situations which make their back pain worse, such as certain positions and activities. However, in persistent back pain, the pain may not be an indication of damage or inflammation. (See previous section, ‘Why does back pain become persistent?’) Education, therefore, plays an important part in the pain management approach and will include a full explanation of the physical and psychological factors contributing to a person’s pain. In this situation it is often possible for people to do exercise and get fitter, although this may be a slow process. In this way people regain their physical confidence and are able to do more despite their pain. Specific exercises also help to strengthen the back muscles that have become weak with lack of use. Should I have an X-Ray or Scan? Generally speaking, if your back pain has come on recently then a plain x-ray of your back will not help. There are two main reasons for this. Firstly, most back pain comes from the soft-tissues of the back (such as ligaments and muscles) and these can’t be seen on a plain x-ray. Secondly, as we get older we all have changes in the bones of the back which are due to wear and, on a plain x-ray, these can be mistaken as the cause of the back pain. If a nerve is trapped then a CT or MRI scan may help, particularly if surgery is planned. These are expensive tests and they are not carried out without good reason. What back exercises should I do? Exercise is the most important way that you can help yourself. Any form of continuing pain will mean that you stop moving so well. This leads to your muscles wasting and this will make your back weaker and easily tired. So you need to restore strength and flexibility in your back. The body needs strong back muscles to work as a shock absorber for jolts and knocks which are part of daily life. 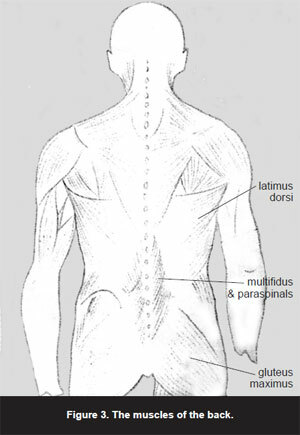 If you look at Figure 3 you will se that the back is covered largely by muscles. You may be advised about specific exercises by a physiotherapist. Even when your back is sore you can make a start without putting too much stress on you back. Also, remember that your back may feel sore after the first few days of exercise – this is normal so don’t let it put you off (it may help to take some painkillers before exercising on these days). general fitness. This can be improved by any exercise which makes you out of breath, but choose something you enjoy such as swimming, cycling or walking, or even keep-fit classes. What sort of things might make my back pain worse? Lifting heavy weights incorrectly. Avoid lifting heavy objects if you can. If you must do it, always keep the weight close to your body and bend your knees. Spending long periods bending over such as when gardening. Use special gardening tools. Worrying. Try to avoid stress and too much worry – this can often make your back pain worse. You may want to try relaxation classes. Talk to others and make a plan about things which worry you. Not taking regular exercise and doing your back routine! Corsets are still commonly prescribed by doctors but they don’t usually do the job they are meant to do (which is to restrict your movement and carry some of the weight of the upper body). People can become dependent on corsets. We recommend you strengthen your back by doing exercises and do not rely on corsets. Manipulation may help to get rid of a spell of back pain – it is most commonly done by chiropractors and osteopaths but also by physiotherapists and some doctors. There are different types of manipulation and it can mean anything from using small hand movements to more vigorous movements using the limb as a ‘lever’. Ask your GP or consultant. If you have osteoporosis of the spine your therapist must be warned. Pressure on a vertebrae might cause a fracture. Should I get a new bed? Many people with back pain prefer a firm surface to lie and sleep on as they feel the back is better supported in this way. 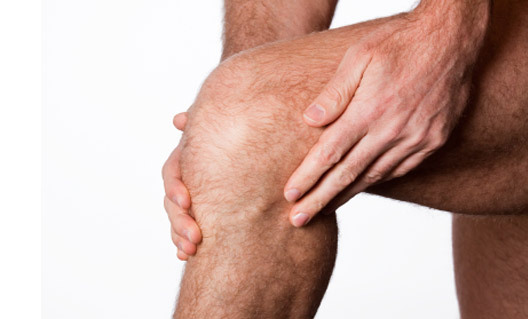 Many so-called orthopedic beds provide this level of firmness. However, you may be able to get the same effect just by putting a board under your mattress. Look around carefully and try things out before buying a new bed. What aids and appliances are available? If you have long-standing back pain, you may need to change how you do things to avoid making the pain worse. For example, as mentioned earlier, gardening can make you bend over for long periods of time. You should make changes such as using long-handled gardening tools. You can also buy lumbar supports for use when sitting at home, at work or in the car. Most towns have a centre or shop where these aids can be tried and purchased, for exampled Disabled Living Centres. You could also ask for advice from an occupational therapist who will help you change activities and advise on equipment or supports. Do any special diets help? If you are overweight, you should consider a weight-reducing diet because of the extra strain this puts on your leg joints and back. Exercise will help you to lose weight. As you will also be advised to stop smoking (as this may be an independent cause of back pain), you should take extra care to prevent the weight gain that often follows. See the article ‘Diet & Arthritis’. Should I give up work? The answer to this question depends on your back pain, your age and your job. During a spell of back pain, we recommend that you try to stay at work or get back to work as soon as possible. If your job involves heavy physical work you may need some help when you return – talk to your foreman or boss. Statistics show that the longer you are off work the less likely it is that you will return. People who work – particularly in physical jobs – may struggle if they develop persistent back pain. If you are disabled due to back pain and wish to carry on working then it is important to see an occupational therapist to advise you. A period of rehabilitation may help you get back to work. Ask if there is such an establishment at a hospital near you. Are any self-help groups available? A number of local self-help groups meet on a regular basis in the Cape, Johannesburg, Soweto and Pretoria. Activities vary from meetings with a speaker to social activities and exercise classes. Summary – what can I do to help myself? Remember, don’t panic! Most spells of back pain will get better. Secondly, don’t rest for too long after the start of the pain – two to three days at mot. Too much rest is bad for you – your muscles become flabby, your bones become thin (lose density) and it becomes even harder to get going again. Thirdly, gradually increase your normal activities, avoiding painful movements. Do your back exercises regularly (see section ‘What back exercises should I do?’) and without fail twice a day. This is your chance to fight back. You won’t notice a dramatic change but over time your back will become stronger and you’ll feel more confident about it. You will be able to lift again within the safety limits recommended. Take up some additional forms of exercise (What more?! Yes more! – we suggest you change your way of life). Keep-fit classes, exercise bikes (or the real thing is better) and swimming are all good exercises. Stop smoking. It makes exercising difficult and it may make back pain worse.